Powervault stores your energy using either Lithium-ion cells or Lead Acid batteries. 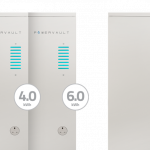 Powervault’s Lithium-ion cells can store 2kWh, 4 kWh or 6kWh of usable (AC) energy. Powervault’s Lead Acid batteries can store 2.5 kWh, 3kWh and 4kWh of usable (AC) energy. The dimensions of the Powervault unit remain the same; it is only the battery configurations inside that vary.